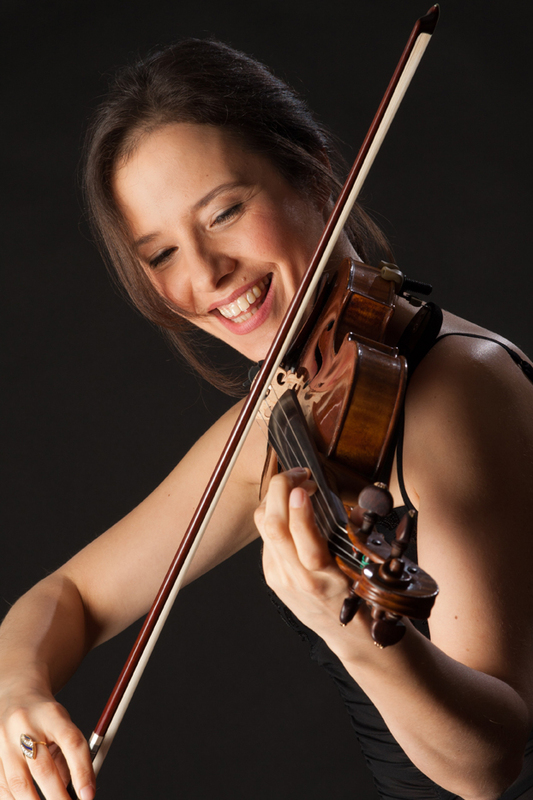 Virtuoso Natasha Korsakova, of Russian-Greek decent, is one of most popular violinists of her generation. The German Süddeutsche Zeitung describes her ability to play the violin as a “sinfully beautiful listening experience”. The young violinist who speaks five languages is currently a coveted guest for national and international orchestras, music festivals and concert events. The artist stands for “Perfect technique, bold stylistic sense and musical intuition (FAZ) as well as for a charisma that without equal. Her repertoire includes ca. 60 Concertos for Violin and Orchestra as well as numerous chamber-music works. The award-winning violinist has appeared in some of the world’s most prestigious concert halls such as the Wigmore Hall in London, the Auditorium di Milano, the Accademia di Santa Cecilia in Rome, the Martinu Hall in Prague, Tokyo’s Santory Hall, the Grand Hall of the Moscow Conservatory, the Konzerthaus Berlin, the Concertgebouw of Amsterdam, the Alte Oper in Frankfurt etc. Among the international festivals are Uto Ughi per Roma, the Ludwigsburger Festspielen (Germany), Incontri Asolani (Italy), the Schleswig-Holstein Festival (Germany), Music in Country Churches (UK) and the Lockenhaus-Festival (Austria). Upon invitation from Mrs. Irina Schostakowitsch, Natasha Korsakova appeared in Paris as part of a festival concert honoring Dmitri Schostakowitsch, together with pianist Kira Ratner. She has co-operated with renowned conductors such as Mstislav Rostropovich, Alain Lombard, Alun Francis, Steven Byess, José G. Flores, Leif Bjaland, Heiko Matthias Förster, Charles Olivieri-Munroe and David Wiley. Natasha Korsakova plays with the Iceland Symphony Orchestra, the Orchestra della Svizzera Italiana, the Orchestra Sinfonica di Milano G.Verdi, the Regina Royal Symphony, the Philharmonic Orchestra of the Dutch Radio Broadcasting, the Mainz Philharmonic, the Düsseldorf Symphony, the Orquesta della UNAM (Mexico), the Queretaro Philharmonic, the Cape Cod Symphony, the Evansville Philharmonic and many others. She is also an enthusiastic chamber musician. The violinist was the first musician to receive the “Russian Muse” Prize. In 1998, she became “Artist of the Year” in Chile. In the year 2004, she performed the Tchaikovsky Concerto in Berlin for the 15th anniversary of the fall of Berlin Wall. Since 2008, Natasha Korsakova developed a particular connection to Italy, where she was awarded the «Premio Sirmione Catullo» and became «Artist of the Year». Recitals followed in Palazzo Quirinale and at the famous Piazza Campidoglio in Rome, both concerts were in the presence of the Italian State-President. Natasha Korsakova is a cultural ambassador of “Fondazione Sorella Natura” in Assisi, Italy. In the connection with the Audience for Fondazione Sorella Natura, she played for the Pope Benedict XVI at the Sala Nervi in Vaticano (2011), together with the outstanding swiss violinist Manrico Padovani. A passionate communicator, Natasha followed the invitation to the International Conference “21minutes Knowledge of Excellence” in Milan. Among participants David Gross (Nobel Physics Prize 2004), Woodrow Clark (Nobel Peace Prize 2007), Susan Polgar (Chess Grandmaster), Mario Brunello (Violoncellist). She is often invited for guest-appearances at the Italian TV-transmissions and talkshows for programs RAI and SKY. Internationally renowned composers such as Daniel Schnyder and Robert Vinson have written and dedicated Ms. Korsakova the Violin Concertos “Mozart in China” and “Concerto in F – Tribute to G. Gershwin“. The violinist was born into a music family in Moscow and began playing the violin at the age of 5. Her first teacher was her grandfather Boris Korsakov. He was followed in her musical education by her father, the well-known Russian violin virtuoso Andrej Korsakov. Her mother is the pianist Yolanta Miroshnikova-Caprarica. After the early death of her father, Natasha Korsakova studied under the tutelage of Prof. Ulf Klausenitzer in Nuremberg and then later with Prof. Saschko Gawriloff in Cologne. Natasha Korsakova plays alternately the violin of V. T. Panormo (1775), on loan by „Sinfonima Stiftung“ of Mannheimer Insurances (Germany). The artist currently resides in Switzerland. To learn more about this artist, please visit: www.natashakorsakova.com.